In his introduction, editor John Gosslee observes that there is no other book out there that focuses solely on contemporary living women artists. “It was shocking, given how many women are progenitors of styles and movements in contemporary art…” (p. 5). I was not shocked to read this. Anyone who had spent any length of time reading feminist art history would have some awareness of this problem. Fortunately, editor Heather Zises and foreword author Elizabeth Sackler bring a greater depth and awareness of women in artists in their short essays. But this review is not about commenting on the book’s words. All of the writing is secondary to its images. The book is an artsy adult picture book that tells a story of contemporary art. It is a resource for thinking about the art that women make in our contemporary world. The format is straightforward and there is an attempt at rejecting patriarchy in its organization, as the artists are listed alphabetically by first name. Each one has a short bio and there are a handful of examples of their work. Like any good art historian, I got this book and immediately flipped through the pictures, and only afterward looked for a list of the artists. I only recognized a few names: Kara Walker, Maya Lin, Page Turner, and Judy Chicago. I am a medievalist by training, so my focus has not been on contemporary art. I taught art history in the art department at my university for a decade, but only ever covered the topic at the end of my general education survey class or at the end of my class on twentieth century art. However, as I worked by way through the illustrations, there were many familiar themes that echoed women’s art of the twentieth century. Perhaps the most dominant of these is the transformation of bodies, typically women’s bodies, into other objects or forms. This produces effects that appeared grotesque, unnerving, or ordinary. These modified bodies serve as a commentary on the ways in which society views women and their bodies and on how women view themselves and their bodies. This theme of transformation encourages viewers to consider what society asks of women individually and collectively. None of these bodies get to be purely and wholly human, there is always another agenda at work. This theme recalls the work of Surrealists in the early twentieth century, one of the first Western art movements to embrace women’s participation. E.V. Day’s sculptures of bound and suspended women’s legs reminded me of Surrealist artist Dorothea Tanning’s Rainy Day Canape (1970). 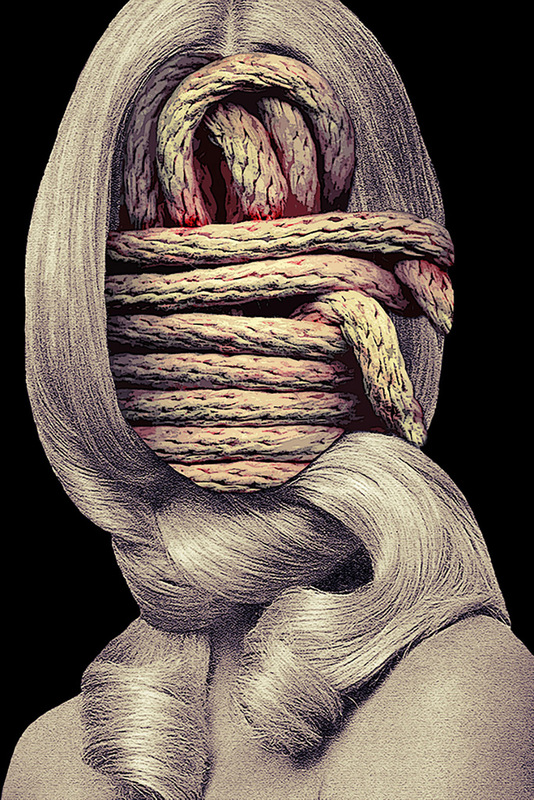 Eugenia Loli’s Knots (2016) pairs nicely with Magritte’s Son of Man (1946). The furry legs of Firelei Báez’s Palmas por Marti (novias que no esperan) (2016) remind me of the sensuality and uselessness of Méret Oppenheim’s Object (1936). When I saw the list of artists named, my heart swelled with pride to see one of our own listed next to the likes of Kara Walker and Judy freakin‘ Chicago. 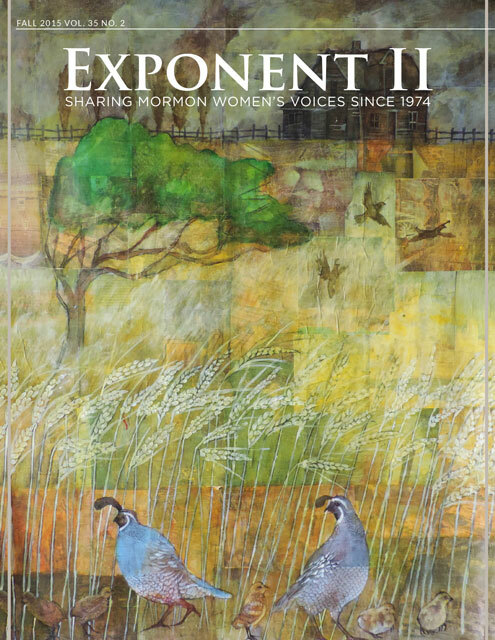 Page Turner is the art editor for Exponent II and her assemblage work has appeared on the cover of the magazine. It is unusual for people in the contemporary art scene to take notice of religious artists, but Page’s approach to her Mormon heritage is both sympathetic and compellingly innovative. There are no sheep or men in bathrobes pretending to be Jesus in her work. She rejects the artificiality of painterly realism for a mysticism that is rooted in the unpretentiousness of everyday objects. As someone who hates the Renaissance and its legacy of beauty-as-divinity, I’m a huge fan. My favorite piece is one that I have seen in the magazine and is reproduced in this book. 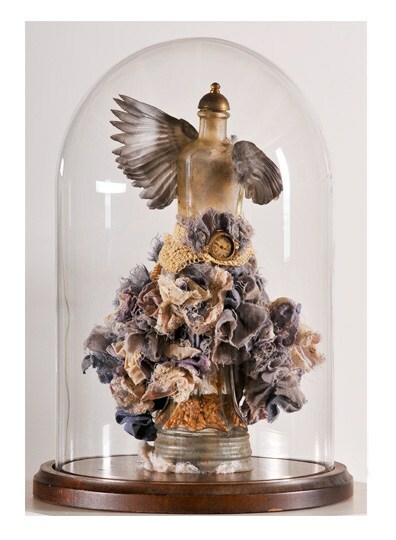 Page made Matriarch to Millions (left) in 2010 with a slender glass container dressed in a skirt of assorted vintage fabrics. The ruffles have an inviting texture and there is a watch face at the top of the skirt. Feathers take the place of the figures’s arms. I imagine that I could find all of these sorts of items in my multi-generational Mormon mother-in-law’s sewing closet. The figure itself recalls the iconography of the ancient Greek Hellenistic sculpture Nike of Samothrace (below), with its lack of head, wings, and drapery folds. In a Mormon context, I read this figure as a suggestion of Heavenly Mother as Mother Time, who is divine and yet embedded in the ordinary elements of Mormon women’s lives. She is shut away in an attractive glass case, both present and distant, symbolically visible but unavailable. Nike of Samothrace, c. 200 BCE, parian marble, Louvre, Paris. The main critique I have of this book is its lack of inclusiveness, which is typical of art history. 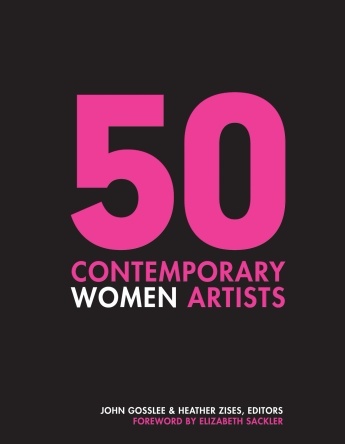 Of the 50 women artists included in the book, perhaps 15 are not from the United States, Canada, or Western Europe. As far as I can see, the editors did not include artists from central or South America, the Pacific Islands, Eastern Europe, Central Asia, or Africa, even as art historians are spending more time researching the contemporary art histories of these places. The group of 50 women includes few women of color and, as far as I can see, no indigenous women. I do not see LGBTQ identities or disability referenced in any of the bios. Art history, as a discipline, must create more space for narratives that are critical of colonization, heteronormativity, and cisgender and ableist perspectives. Feminist art historians, artists, and critics do not conquer the rigid patriarchy of the art world without them. This lack of diversity limits the conversation to mostly artists whose work falls within the heritage of Western art, whose narratives we should actively challenge. There is much to like about this book, but we must do better. And you’re right about the lack of inclusion. Despite it being a problem just about everywhere, it still needs to be pointed out and it still needs to be changed. Love this review, Nancy, and love Page’s work. Nancy this sentence made me laugh out loud: “There are no sheep or men in bathrobes pretending to be Jesus in her work.” Thank you fit spotlighting Page and teaching me something about the way women’s bodies are portrayed.